Chingay started in Singapore in 1973. It was started as a response to the banning of fireworks in order to ensure that the ban would not dampen the Chinese New Year celebrations. The first Chingay parade comprises of floats, acrobatic acts, lion and dragon dance , stilt walkers and others to liven up the atmosphere. It proved so popular that we are now in the 44 edition of Chingay in Singapore. By the invitation of People's Association , Chingay main organiser , the family was invited to Chingay 2016 parade as a 'social media influencer'. It was a delightful invitation as it meant that it would be the first time we experienced Chingay as one family. It was an upgrade from my last participation as a media photographer for Chingay 2013. Celebrating the festival as a family sure beats experiencing it on my own. 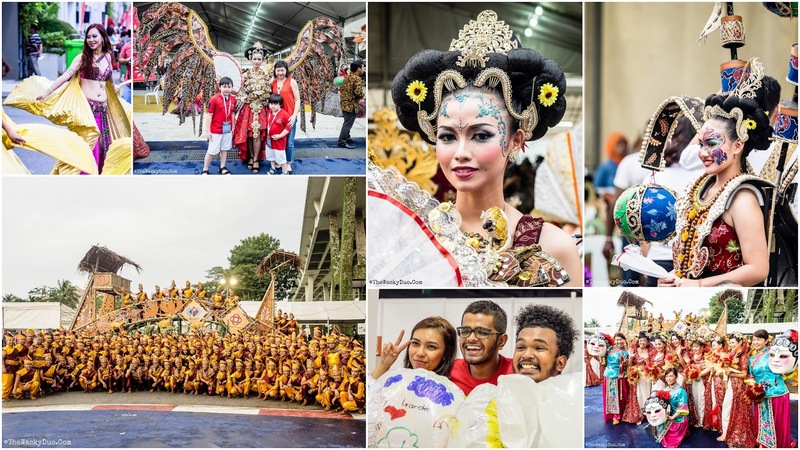 If you are unware , Chingay in Singapore is a multicultural event. Today the street parade is now a National festival celebrated by Chinese, Malays, Indians, Eurasians and even overseas participants. In fact , the Chingay Parade feels like a National Day Parade ex the military side of the parade, making it a vibrant atmosphere to indulge in. It is truly a festival with a uniquely Singapore flavour. We were there early to soak in the pre parade celebrations. From what we can see , the participants were all ready to put on a good show ahead with their wide grins and every ready smiles. The crowds were ready too, with a pre parade Chingay Wave. The pre parade segments started with Magic Ning on her super garang wheels. Just check out the picture below to see it in its glory. This was followed by a segment of Kungfu ladies. When night fell, the parade begins with a kaleidoscope of performances. The parade kept its roots of stilt walkers with a twist... futuristic stilt walkers with real firecrackers! Joining the colourful parade are folks from all walks of life. The event had both the young and young at heart giving their best performances for the evening. If you have not been to a Chingay Parade, it would be quite similar to a Disneyland parade where there are floats and small performances along the way. With over 8000 parade performers from 150 organisations and 8 different countries , Chingay 2016 will be massive in comparison. Our parade was graced by the President Dr Tony Tan. The first segment kicked off with a look into the future. Take a journey towards SG 100 with People's association Youth Movement. The LED display creates an impressive blue hue to light up the light. There were accompanied by the Fire breathers and an impressive array of Dragons and Phoenixs. The star of the Dragon dance will no doubt be the 66m long LED Dragon. It made its debut appearance at the Chingay. The next segment showcased the diversify of Singapore culture. Performances by Singapore diverse ethnic groups. Given a front seat to the celebration, I must professed that I felt proud to be a Singaporean during the performance. It was amazing to see how a diversified nation can come together and perform as one. Surely, this is the Singapore spirit that lives in us. And because we are different, we are one! Next we were joined by friends from all over the world. from Japan to China to Indonesia to Russia and South Korea, it did felt like a mini united nation at F1 Pit Building. A picture tells a thousand words, so let's enjoy their performances through these photos. Next up are the circus act. You had the sky ballet, the stilt walkers, wheelies and LED bicycle in the act. There was even young kids on wheelies! I had only one question ... where do I go to fix those LED lights on the bikes? To wrap things up , we had a variety of performances representing the communities of Singapore. From street dances, ballets , martial arts and even Pole dancing, it symbolized the variety of activities Singapore has to offer. As the parade came to a close, we were treated to an impressive light show featuring both performers and floats alike. This was followed by our favourite fireworks! We think that the Chingay has improved year on year. This year's edition was by far the the most multi cultural , multinational experience we had till date. Definitely an eye opener event. Thanks to People's Association for the invite. This was ndeed a sensory overload experience to remember for the family! You can catch the Chingay performance on telly on 28th February on Mediacorp channel. Chingay will also be going to the heartlands on the following dates. The Wacky Duo were invited to watch Chingay 2016 Live. All opinions are of our own.